(CNN) -- The Sri Lankan military claimed it has struck a decisive blow against Tamil rebels in the taking of a rebel naval base at Chalai. 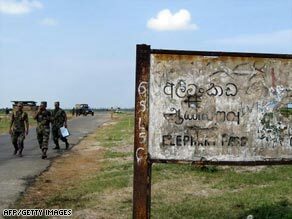 Troops at Elephant Pass, the isthmus connecting the Jaffna peninsula to the rest of Sri Lanka. The "capture of Chalai by army troops several hours ago drove a decisive blow to the entire Tiger organization, now in its death throes with the loss of the biggest Sea Tiger base in the eastern coastal belt," said a statement posted on the military's Web site. The military also said it had killed at least four rebel leaders and 10 other rebels in the fighting Thursday evening in Chalai, a community known for its bazaars. Humanitarian groups say as many as 250,000 unprotected civilians are trapped in the area where the fighting is taking place, and the onslaught has intensified as government forces have closed in on the rebels. The aid agencies have asked for increased access to northern Sri Lanka, calling it a nightmarish situation. Earlier this week, the conflict forced the closure of Pudukkudiyiruppu hospital in the Vanni region, the last functioning medical facility in the area of fighting. Sri Lanka's Defense Secretary Gotabhaya Rajapakse rejected calls Wednesday for a negotiated end to the fighting. He said there would be no political solution, the online edition of The Island reported. Some in the international community have suggested negotiations to give the rebels an opportunity to surrender.